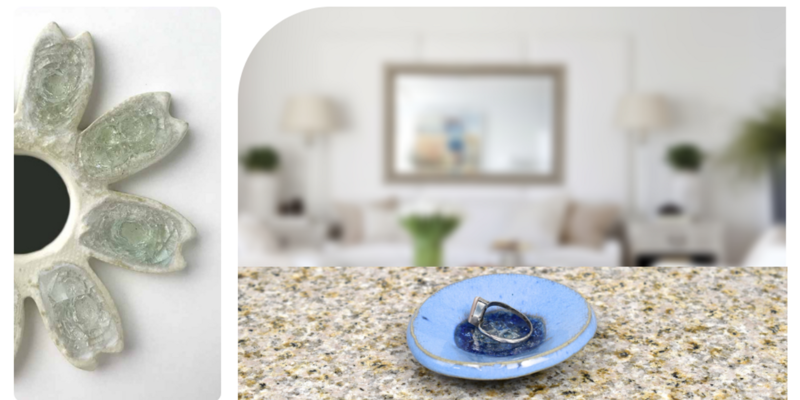 From cool cabinet knobs to unique ring holders, these sparkling home decorations have both form and function in mind. At Paloma Pottery, we strive to create a balance between functional art and organic beauty. All furnishings in our home decor line both serve a purpose and enhance your surroundings while respecting the environment in which we all live. Exquisite eco-gift wrapping brings a full, well-rounded presentation to the works of art they hold. With just enough design, just enough color and more than enough sparkle. A Paloma glass pottery piece is perfect to fill that spot in your home. Watch for this exciting part of our handcrafted line to expand as our artists forge new marriages with pottery, metal, and wood. Delight in perusing the large selection of unique drawer pulls, both naturally rugged and also dazzling with color. In the world of artisan pottery and glass, there is simply nothing else like it. For those who are seeking exceptional quality eco gifts, made in America with unique, earth-friendly design as well as solid business ethics, Paloma Pottery is the place.